Camdenton FIRST® LASER Robotics co-hosted an off season event of last year's competition, Rebound Rumble, at the Missouri State Fair. This off-season event is a way to share the message and inspiration of FIRST® with thousands of individuals that attend the state fair yearly. Each year this event grows and shares the importance of STEM not only to Missouri residents, but also to visitors from across the United States! In May, 3284 team members, coaches, and mentors traveled to Huntsville, Alabama to the NASA Marshall Space Flight Center. A special behind-the-scenes tour was set up for several of the FIRST® NASA "house teams" in different buildings in the NASA complex and students learned about the history and careers of NASA. Students also spent the afternoon at the on site museums. It was a fascinating experience! The Camdenton FIRST® LASER Robotics coaches and mentors presented at the Missouri Department of Elementary and Secondary Education's summer administrative conference in July to share the impact, benefits and effects of FIRST® Robotics on participants & the community. All school administrators were asked to support STEM programs like FIRST® in Afterschool programs and schools. 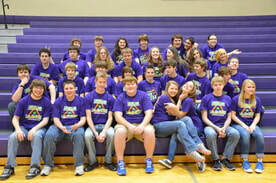 The Camdenton FIRST® LASER Robotics team had a successful year at the St. Louis Regional. Thanks to our innovative Build-a-Bot station and our safety captain, LASER 3284 won the Safety Award for the third year in a row. In addition, our team member Kyle was nominated for the prestigious Dean's List! We were also honored to have won the entrepreneurship award for our business plan. To top off this great event, our alliance won first place and is moving on to the World Championship! Thanks to all who made the long trip to St. Louis to cheer us on and thanks to all of the Camdenton community for your support of our team. ​Our team faced many tough challenges in the 2012-2013 build season, but in the end we produced a high quality robot to compete in FIRST® competitions and to promote STEM at local, state and national levels. Most importantly, we all learned a lot during the process not only about STEM but about ourselves, perseverance and commitment. LASER 3284 had our official kickoff on January 5th, 2013. We watched a video explaining the Ultimate Ascent game and immediately started to brainstorm about how to tackle this year's challenge. We also engaged in team building activities and had a team collaboration session in which we discussed our strategy for this year's competition with our mentors. On December 5th, several student representatives and coaches presented at the Missouri Society of Professional Engineers Conference in Jefferson City. Students shared their personal FIRST® experiences and encouraged professional engineers to become mentors and become part of the FIRST® system. Professional engineers "test drove" the 2012 "Abrams" robot and learned the core values of FIRST®. The Camdenton FIRST® LASER Robotics team attended the Cowtown Throwdown event in Kansas City on November 2nd, 2012. LASER 3284 team members enjoyed competing with so many gracious professionals, and look forward to attending more competitions. Cowtown is a great event to introduce incoming freshmen to FRC® without the pressure of an official FIRST® event. The Camdenton FIRST® LASER Robotics team visited Boeing in St. Louis on October 12th, 2012. Team members toured Boeing and learned about the process Boeing uses to create aircraft, as well as the history of Boeing. Careers in the aviation industry were also discussed. Team members had a fun time learning about one of our major sponsors and were able to graciously thank employees that help make our FIRST® system a reality for 250 students each year.